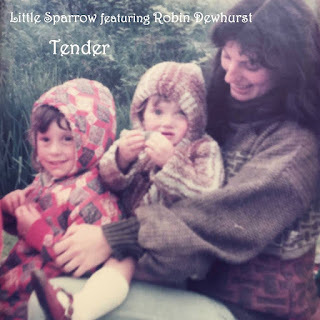 Tender is the first song taken from Little Sparrow's new EP Just 3, a collaboration with classical pianist Robin Dewhurst and her first new material since her acclaimed album Wishing Tree. The accompanying video is made up of photographic memories of some of her fans that she sourced through a Facebook request. The collaboration with Robin, who is father of Blossoms' Josh as well as being head of the music directorate at Salford University, came about as a result of them playing together at Kendal Calling having been brought together by 6 Music's Chris Hawkins, who has been a big supporter of (Little Sparrow) Katie's career so far. They performed a cover of Madness's Baggy Trousers which is also slated for release as part of the EP. Cellist Sarah Dale, who played on Wishing Tree, also features on the single. Like many of Katie's lyrics, Tender is a deeply personal song, but one that will also be relatable for many others. Her stunning showstopping voice, which was very much to the fore on Wishing Tree, also takes centre stage here, each emotion being relayed in the song's lyrics given extra force and gravitas by the power and control of range that she exercises throughout the song. Tender is out now on all digital platforms including Little Sparrow's Bandcamp. Little Sparrow's website can be found here. She is also on Twitter and Facebook.